The large pink pig was the star of the festa del maiale (the festival of the pig) but it had little to celebrate, and he knew it. It took four big men to drag the squealing creature out of its sty, through the sleet and darkness, and into a cold cement courtyard. Groups of laughing adults and excited children, waiting impatiently, cheered them on as they arrived, parting to let them through, and then falling silent as the norcino, or butcher, gestured theatrically for a shining silver pistol, which he pressed into the soft skin between the pig's ears, and fired. The pig's legs slid apart and it dropped to the ground, a final shudder shaking its body from shoulder to tail. The festa is a pagan ritual that, despite industrialisation and the laws of the European Union, takes place at the beginning of winter in much of rural northern Italy. For centuries, and probably millennia, the fattened pig has been slaughtered as part of the preparation against the hardships of winter. Once killed, it takes less than twenty four hours to transform a two hundred kilogram pig into a range of smallgoods, from sausages and hams to stuffed trotters and cured skin, everything but the tail is used. It is a collective event with everyone helping, neighbours, friends and far-flung family. Today, however, in Colonnata, an isolated village in the marble mountains that rise above the coast of northern Tuscany, the festa has taken on a more commercial imperative and, ironically, it is the poorest cut of all, the lardo, or pig's fat, that has made this tiny settlement both rich and famous. Colonnata sits precariously on a ridge of crumbling rock separating two towering cliffs of white marble that have been quarried since Roman times. It was the columns (or colonne) of Roman slaves clambering up the sheer marble faces that gave the village its name. The slaves' staple food was lardo, the fatty off-cuts of the local pigs that thrived in the neighbouring oak and chestnut forests - it was cheap and it gave them the energy and strength to resist the appalling conditions under which they worked. Strips of lardo eaten on slices of stale unsalted bread, sometimes accompanied by a raw onion or a tomato, remained the staple of the cavatori, or miners, until a generation ago. Over the centuries, the locals created their own ways of preserving this modest but essential resource, using whatever was at hand - sea salt from the nearby coast, wild herbs, and the marble they quarried every day, to hold and store the lardo. Without having tasted this exquisite delicacy, it is difficult to credit the extraordinary flavour, texture and passion that surround the lardo di Colonnata. The finest lardo is cut from the haunches of the pig, and has a rich, creamy colour shot with deep pink streaks. It is best sampled simply as an antipasto, wafer-thin slices layered on plain toast, with a fine glass of red wine from the nearby Colli di Luni. The best lardo melts at around 37 degrees, dissolving in your mouth with a velvet smoothness and releasing the aromas of the spices and herbs in which the lardo has been preserved. Eleven families produce a total of less than one tonne of lardo a year, and each family has its own secrets. The essential ingredients, however, must include sea salt, fresh garlic, cloves, nutmeg, cinnamon, pepper, time to mature, and, of course, the local marble. Danilo Rossi is recognised as one of the experts. He begins with the selection and preparation of the conca, a large tub carved out of a single block of the unusually porous marble from the nearby quarry. 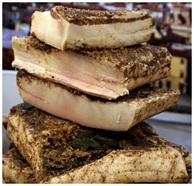 The pieces of lardo vary in weight from five hundred grams to one kilo, and from five to eight centimetres in thickness. Danilo says the key to success is in the freshness. The curing has to begin within twenty four hours of the killing, and the lardo should not spend even a day in refrigeration. The conca is first rubbed with fresh garlic and then layered with rosemary leaves, sea salt, minced cloves, cinnamon, nutmeg and a dusting of pepper. The lardo pieces are then pressed firmly into place, and the process is repeated until the conca is full. The art is then to maintain the precise balance between temperature and humidity that the lardo needs to age, from between five and twelve months. Over time, the salt draws the water out of the fat, at the same time drawing in the flavours of the herbs and spices that surround it. Lardo di Colonnata was a well-kept secret until local restaurateur Venanzio began to introduce it to a wider world, and until the scandal of 1996, when EU health inspectors arrived. Horrified by the "unsanitary" practices, EU representatives demanded that production stop until the appropriate modern methods were introduced. The Colonnatesi rebelled and successfully challenged the ruling. In so doing, they set a precedent for other artisan producers throughout Europe and became national heroes along the way. Today, lardo di Colonnata is on the menu's of some of the world's most fashionable restaurants, including Louis XV in Monte Carlo, Cirque in New York and Carpaccio in Paris. Inside Italy it has become a cult object among conspicuous consumers, rivalling Brunello di Montalcino and Zegna suits as a sign of sophistication and good taste. A kilo of lardo di Colonnata can cost more than $40. Back at the farmhouse, I had lost my nerve. As the norcino reached for a large steel knife to slit the prostrate pig's throat, I decided to withdraw to the warmth and safety of the kitchen and a large glass of grappa. Looking through a cracked window at the primitive festivities outside, it was difficult to reconcile the reality of Colonnata (which, despite two excellent restaurants and a scattering of tiny bottegas, remains a ramshackle village, seemingly on the verge of subsiding into the valley) with the international celebrity and status of such an unlikely product. Norcia is a small town high in the Sibillini Mountains in Umbria. Its name is synonymous with pork butchery throughout central and southern Italy. A norcineria is a deli specialising in pork goods and a norcino is an expert pork butcher. Until recent times, the norcini escaped the bitter winters of their hometown, travelling through central Italy plying their trade as itinerant butchers. Traditionally aloof and mysterious figures, they often officiated at the killings of the local pigs, lending their experience and prestige to the preparation of the meats. It is believed that the norcini originally learnt their skills from the neighbouring abbey of St Eutizio, which, during the Dark Ages, had a reputation as a centre of surgery. When it was suppressed in the 13th century, the knowledge spread out to the surrounding towns. Nearby Preci continued the medical tradition, being particularly renowned for its eye surgeons (one doctor was summoned to London to remove a cataract from Queen Elizabeth I) as well as a centre for castrating young opera singers. Norcia, on the other hand, applied the skills to pork butchery, and it remains one of the gastronomic capitals of Italy.